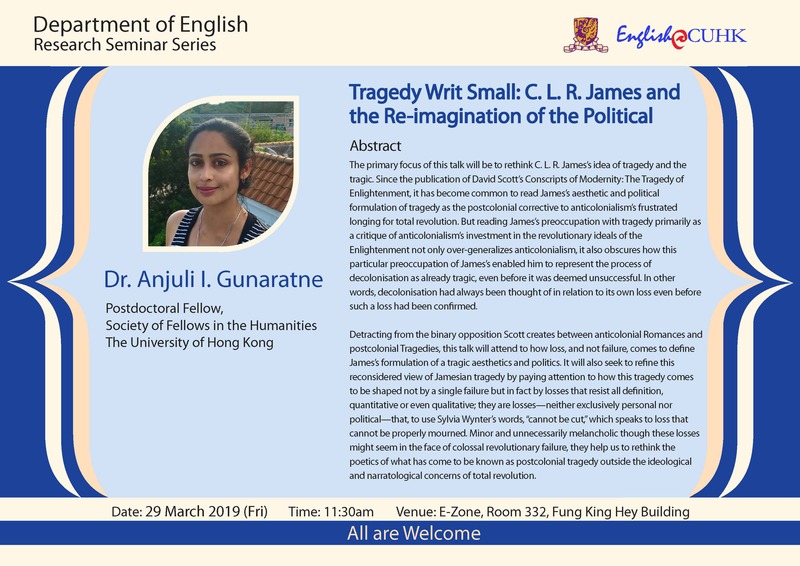 The primary focus of this talk will be to rethink C. L. R. James’s idea of tragedy and the tragic. Since the publication of David Scott’s Conscripts of Modernity: The Tragedy of Enlightenment, it has become common to read James’s aesthetic and political formulation of tragedy as the postcolonial corrective to anticolonialism’s frustrated longing for total revolution. But reading James’s preoccupation with tragedy primarily as a critique of anticolonialism’s investment in the revolutionary ideals of the Enlightenment not only over-generalizes anticolonialism, it also obscures how this particular preoccupation of James’s enabled him to represent the process of decolonisation as already tragic, even before it was deemed unsuccessful. In other words, decolonisation had always been thought of in relation to its own loss even before such a loss had been conrmed. Detracting from the binary opposition Scott creates between anticolonial Romances and postcolonial Tragedies, this talk will attend to how loss, and not failure, comes to dene James’s formulation of a tragic aesthetics and politics. It will also seek to refine this reconsidered view of Jamesian tragedy by paying attention to how this tragedy comes to be shaped not by a single failure but in fact by losses that resist all denition, quantitative or even qualitative; they are losses—neither exclusively personal nor political—that, to use Sylvia Wynter’s words, “cannot be cut,” which speaks to loss that cannot be properly mourned. Minor and unnecessarily melancholic though these losses might seem in the face of colossal revolutionary failure, they help us to rethink the poetics of what has come to be known as postcolonial tragedy outside the ideological and narratological concerns of total revolution.